Babblings of a Mommy: Sheer Cover Mineral Make-Up Giveaway!!--CLOSED. Sheer Cover Mineral Make-Up Giveaway!!--CLOSED. OK girlies, you've already heard me gush about Sheer Cover's mineral foundation, and I how I've been using it religiously since I got it. But now it's your turn to get a little somethin' somethin' nice... Sheer Cover is giving one of my readers a whole make-up kit, for free!!! Here's what you'll be getting.. The Sheer Cover® Mineral Foundation is a unique 4-in-1 formulation that acts as sun protection, anti-aging protection, foundation, and finishing powder. Natural SPF 15 protection and anti-oxidant properties from Green Rooibos Tea help protect against premature aging. You’ll receive two shades from Light, Medium, Tan or Dark to help you achieve your desired color. Our concentrated, creamy Concealer is ideal for hiding blemishes, redness, age spots, and to camouflage under eye circles. You can artfully blend the two shades to help perfect your skin without the heavy, cakey coverage. Prime your skin to smooth perfection with the Base Perfector before applying the Duo Concealer and Mineral Foundation SPF 15. One invisible thin layer helps keep powder from setting into fine lines and makes pores and wrinkles appear smaller. Skin nourishing ingredients include vitamins A and E, green tea, cucumber and marine extracts. Lightly brush this radiant loose powder on your cheeks, lips, eyes, neck and shoulders to illuminate your best features. The Lip-To-Lid Highlighter uses light-reflecting minerals to give you a natural-looking glow. Formulated with moisturizing silk powder, this lengthening and volumizing Mascara perfectly coats lashes while conditioning them to help strengthen and reduce breakage. Specially developed for sensitive eyes, the smooth, non-clumping formula separates and lengthens for sleek, smudge-proof lashes. Brown/Black shade. This elegant mirrored compact holds blush, lipgloss and eye shadow in a versatile range of sophisticated shades. Blush (Ginger), Lipgloss (Carmel Ice and Ballerina), and four eye shadows (Sable, Pebble, Charcoal and Mauve). This Concealer Brush is an expert secret to covering imperfections. The interlocked synthetic fibers are specially designed for precise application. Plus, the tapered and firm contour allows easy application of Concealer to any hard-to-reach spots. This Foundation Brush is made of natural goat hair and helps you achieve a flawless foundation finish, allowing powder to go on smoothly and evenly. Perfect for buffing and blending. 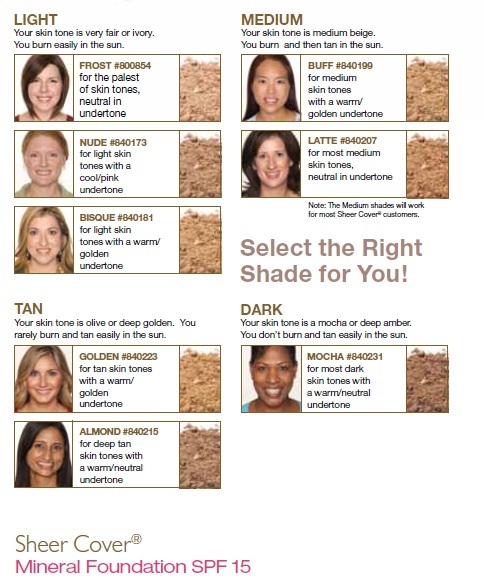 If you're worried about not being able to find your shade, don't! 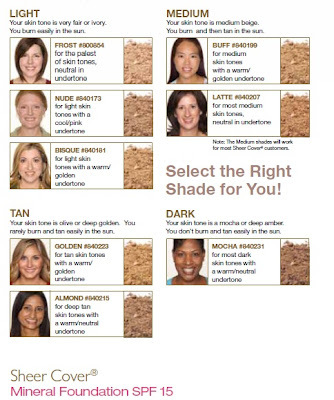 Your kit comes with two blendable shades so you can match your true skin tone. To enter simply "Like" me on facebook and mention the giveaway on my wall. Then come back here and let me know that you've entered by submitting a comment below. Easy peasy! *Don't forget to leave me your email address! Winner will be notified via email. "Like" Sheer Cover on Facebook. Follow Sheer Cover on Twitter. Remember each one counts as a different entry so be sure to enter them separately. You may tweet once a day if you'd like, but be sure to leave comment on post about your re-tweets. I do check and verify entries. Giveaway ends October 12th. A winner will be selected by random.org and will be notified via email. Posted on your facebook wall. Following Sheer Cover on Twitter. I liked babblings of a mommy on FB and left a comment there (Nina Hedin). I "like" your Facebook page (FB name: Maddie Brubaker) and I wrote on your wall. I "Like" Sheer Cover on Facebook (FB name: Maddie Brubaker). I follow Sheer Cover on Twitter (@shala_darkstone). I'm already a Google Friend Connect follower as shala_darkstone. I like you on Facebook (kelly blackwell) and I left a comment on your wall about the giveaway. Thanks for hosting it! Posted on FB! Thanks for the chance to win! Liked Sheer cover on FB! Following Sheer Cover on twitter! I'm a follower on GFC! Thanks! I liked you on FB and commented as Holly Storm-Burge. I subscribed through RSS on Google Reader. I like sheer cover on facebook! follow you and tweeted about this! Hi!! I left a comment on your wall about the contest. I'm so excited!! Love your blog!